Naturally occurring radionuclides are known to be present in varying proportions in rocks and soil of different geological formations around the world. Their concentrations and associated external doses in different environments depend on the geology and geographical conditions in such environments. Due to weathering and other environmental processes, radionuclides in rock and soil may accumulate in sediment and dissolve into drinking water, thereby leading to human exposure. Exposure to natural terrestrial radiation in the outdoor environment is predominantly from radionuclides that are present in the upper 30 cm layer of the soil. Human exposure pathways include: Root uptake from contaminated soil, direct ingestion of radionuclides deposited on plant leaves, consumption of water animals, ingestion of contaminated water, inhalation of soil dust, and the direct exposure to gamma ray emitted from primordial radionuclides in the indoor and outdoor environments, etc. Studies on natural radioactivity are necessary, not only because of their radiological impact, but also because they serve as excellent biochemical and geochemical tracers in the environment. 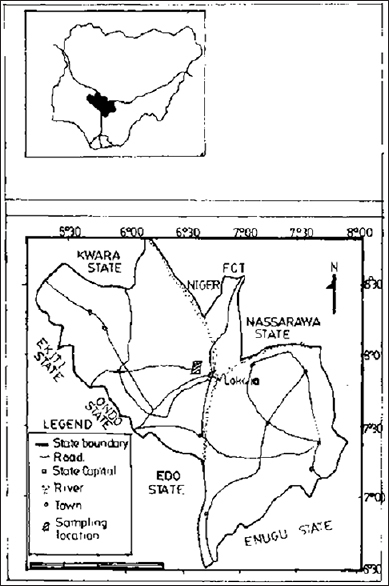 In the present study, the activity concentrations of terrestrial radionuclides in marble rock, soil, farmland soil, and sediment around Obajana cement factory, North Central Nigeria have been measured to determine the outdoor radiation exposure and the radiological implications of using the marble as a component of cement manufacturing. The results of studies such as this are of great interest in an environmental radiological protection study, especially for Nigeria, where marble is widely used as a building material. To the best of our understanding, no such study has been carried out in this area. The study, therefore, will form a baseline on which any extended radiological research in this area can be compared. where C is the count rate of gamma rays, ε is the detectors efficiency of the specific g-ray, Pg is the absolute transition probability of g-decay, M s is the mass of the sample in kg, and T is the counting time in seconds. 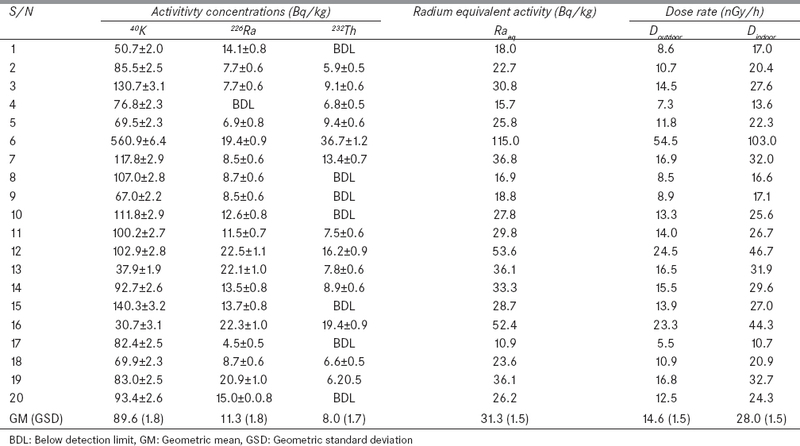 The activity concentrations obtained for the measured radionuclides are expressed in Bq/kg per dry weight. The ultimate use of the measured activity concentrations in any material is to assess the radiological hazards incurred by man either outdoor or indoor. Outdoor exposure is considered for the population working on the mining site and adjoining farmlands as well as those living in the immediate environment, while the indoor exposure is for those living in cement houses made from marble rocks used in the Obajana cement factory. The radiation hazards of the radionuclides uniformly distributed in marble rock used as a major component of Dangote cement was assessed through various radiation hazard indices, which include radium equivalent activity, outdoor dose rates, indoor dose rates, and annual effective dose rates. where A Ra , A Th , and A K are the activity concentrations of 226 Ra (in equilibrium with 238 U), 232 Th, and 40 K, respectively. Radium equivalent activity is directly related to the external and internal gamma dose due to radon and its progenies. In evaluating the external and internal hazard indices, a critical comparison between radium equivalent activity (Ra eq ), external hazard index (H ex ), gamma index (Ig), and internal hazard index (H in ) shows that all the indices are multiples of each other and convey the same information. They are related in such a way that if Ra eq ≤ 370 Bq/kg, then H ex ≤ 1, Ig ≤1, and H in ≤ 1. Therefore, in this study, only radium equivalent activity was selected to represent the others. where A Ra , A Th , and A K are the activity concentrations of 226 Ra, 232 Th, and 40 K, respectively. where, A Ra , A Th , and A K are respectively activity concentrations of 226 Ra, 232 Th, and 40 K.
The radioactivity levels of 40 K, 226 Ra, and 232 Th were measured in four different environmental matrices around Obajana cement factory to ascertain the radiological health hazards incurred by the population within the vicinity of the study area. The results of the measurements showing the range and geometric mean (GM) activity concentrations presented as GM (GSD) for 40 K, 226 Ra, and 232 Th are presented in [Table 2]. It can be seen from the results that the geometric mean GM (GSD) activity concentrations of 40 K ranged from 89.6 (1.8) Bq/kg in marble rock to 1608.1 (1.4) Bq/kg in sediment. The geometric mean activity concentrations of 226 Ra also ranged from 11.3 (1.8) Bq/kg in marble rock to 63.4 (1.2) Bq/kg in sediment and those of 232 Th followed the same trend with minimum geometric mean concentration of 8.0 (1.7) Bq/kg in marble rock and maximum geometric mean concentration of 27.4 (1.7) Bq/kg in sediment. The radioactive levels of 40 K are seen to be higher than those of 226 Ra and 232 Th at all the sampling points as well as in all the sampled matrices. From the table, it is also clear that sediment has the highest concentrations of the three radionuclides among the sampled matrices with a range of 1000.6-2361.3 Bq/kg for 40 K, 41.8-88.2 Bq/kg for 226 Ra, as well as BLD-124.2 Bq/kg for 232 Th. The increasing order of concentrations for the three radionuclides in all the samples is as follows: Rock < farmland soil < soil < sediment. The mean concentrations of the three radionuclides are slightly lower in farmland soil than those in soil around the cement factory. This might be as a result of leaching, washing away or plant-uptakes of the radionuclides in the farmlands due to continuous tilling of the farmland soil. Also, the farmlands are owned by peasants who seldom apply fertilizer which could increase the radionuclides load in the soil. The high concentrations of radionuclides recorded in the sediment samples as compared to other samples might not be a product of the immediate natural environment but the accumulation of leached material into the water body as the river flows along different geological media or as a result of effluents from the cement factory. A comprehensive result of the activity concentration levels of 40 K, 226 Ra, and 232 Th in marble rock samples is shown in [Table 3]. The activity concentrations of the analyzed marble rocks are generally low when compared with other samples within the study area and a few order of magnitude lower than the worldwide average concentrations of 40 K (500 Bq/kg), 226 Ra (50 Bq/kg), and 232 Th (50 Bq/kg) for normal background radiation environment. 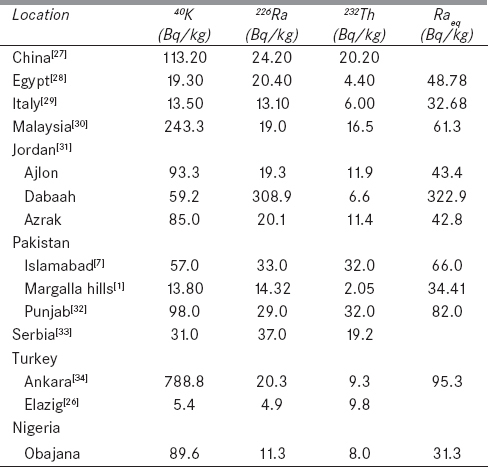 The low concentration of the radionuclides found in marble rock samples in this study is comparable to the situation for other marble/limestone rocks around the world [Table 4]. The Pearson's correlation matrix, showing the interactions among the three radionuclides in the various environmental samples, is presented in [Table 5]. As seen from the table, there exist strong significant positive interactions between 40 K rock and 226 Ra rock (r 2 = 0.996), 40 K rock and 232 Th rock (r 2 = 0.981), 226 Ra rock and 232 Th rock (r 2 = 0.984) at 0.01 significant level. Strong negative correlation is observed between 40 K rock and 226 Ra soil (r 2 = 0.973), 226 Ra rock and 226 Ra soil (r 2 = 0.954) and 232 Th rock and 226 Ra soil (r 2 = 0.955) at 0.01 and 0.05 significant levels. Strong positive relationships also exist between 40 K sediment and 226 Ra sediment (r 2 = 0.935), 40 K sediment , and 232 Th sediment (r 2 = 0.907) and 226 Ra sediment and 232 Th sediment (r 2 = 0.959) at 0.01 level of significance. For farmland soil samples, strong interaction only exists between 40 K farm and 226 Ra farm (r 2 = 0.996) at 0.01 significant level. Positive correlations found among the three radionuclides in rock and sediment samples suggest that these radionuclides originated from the same source for individual environmental matrix. The strong negative interactions between the radionuclides in rock and soil samples may imply similar behavior but different sources. Poor interactions were, however, observed between rock and sediment, rock, and farmland soil as well as sediment and farmland soil suggesting different sources and distributions of these radionuclides. These observations further confirm that the higher concentrations of the three radionuclides observed in sediment samples may be due to anthropogenic sources such as the waste generated in the cement factory. In order to assess the exposure to radiation in the outdoor and indoor environment within the study area, the radium equivalent activity, outdoor and indoor dose rates were calculated using equations 2-4. The radium equivalent activity evaluated in marble rock samples are presented in [Table 3]. For the rock samples, the value of Ra eq ranges from 10.9-115.1 Bq/kg with a geometric mean of 31.3 (1.5) Bq/kg. When compared with the maximum permissible level for materials to be used for building construction, the mean value of radium equivalent activity obtained in this study is several orders of magnitude lower than 370 Bq/kg. This indicates that the Obajana marble rock is safe for use as a component of building materials. 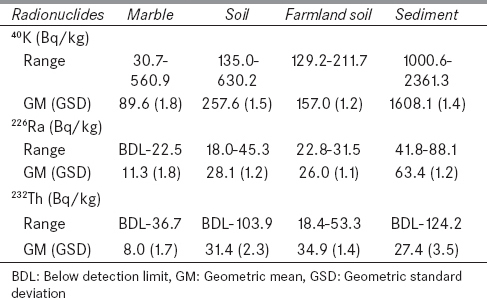 The mean radium equivalent activity obtained in this study for marble rock is also lower than values obtained in many locations around the world [Table 4]. The geometric mean outdoor dose obtained for rock, soil, and farmland soil samples are 14.6 nGyh -1 , 46.4 nGyh -1 , and 40.0 nGyh -1 , respectively. All these values are lower than the mean outdoor dose of 59 nGyh -1 estimated for areas with normal background radiation levels around the world by UNSCEAR. These mean absorbed doses correspond to annual biological effective outdoor doses (using equation 4) of 0.018 mSv/y, 0.057 mSv/y and 0.049 mSv/y, respectively for marble rock, soil and farmland soil and these are all lower than 0.07 mSv estimated as world-wide average annual outdoor effective dose. The gamma dose incurred indoor by the populace due to the activity concentration levels in the marble rocks has been estimated using equation 4 and presented in [Table 3]. The indoor dose ranged from 10.7 nGyh -1 to 103.1 nGyh -1 with a geometric mean value of 28.0 nGyh -1 , which corresponds to 0.137 mSv mean indoor effective dose (equation 6) per year. These values are far lower than the average world-wide values of 84 nGyh -1 and 0.41 mSv, respectively for indoor dose rate and annual effective indoor dose reported in UNSCEAR Reports. , The indoor and outdoor doses incur from marble rocks are always generally low compared with other rock types. , ; this is due to low concentrations of naturally occurring radionuclides in marble rocks around the globe. Measurements of activity concentrations of terrestrial radionuclides in marble rock, soil, farmland soil, and sediment samples collected around the Obajana cement factory have been carried out to ascertain the variations of activity levels of these radionuclides in different environmental samples and to assess the radiological health hazards associated with their use in building construction. The results show that sediment samples possess the highest concentrations of all the examined radionuclides in comparison to other environmental matrices. The activity concentrations in marble rock samples analyzed in this study are generally low. In particular, the activity concentration of 226 Ra and 232 Th in marble rock samples are relatively lower when compared with values obtained in marble rocks from other locations around the world and several orders of magnitude lower than the world average values for building materials. Strong positive relationships were observed among the three radionuclides for rock and sediment samples, respectively, suggesting a similar source for individual matrix. Poor inter-relationships were observed for the radionuclides between rock and sediment, soil, and sediment as well as sediment and farmland soil indicating different sources and behaviors. All the radiological parameters considered in this study have values which are much lower than their permissible limits. It can be concluded, therefore, that Obajana marble rock and other environmental matrices considered in this study do not pose any excessive radiological health hazards, indoors or outdoors and as such could be used without any restrictions. The authors thankfully acknowledge the management and staff of Obajana cement factory for granting the permission to collect the samples analyzed in this study and the two anonymous reviewers whose suggestions helped in no small measure to improve the quality of the manuscript. Ali M, Qureshi AA, Waheed A, Baloch MA, Qayyum H, Tufail M, et al. Assessment of radiological hazard of NORM in Margalla Hills Limestone, Pakistan. Environ Monit Assess 2011;184:4623-34. Paschoa AS, Steinhäusler F. Terrestrial, Atmospheric, Aquatic Natural Radioactivity. In: Baxter M, editor. Radioactivity in the Environment. Amsterdam: Elsevier; 2010. p. 29-85. El Samad O, Baydoun R, Nsouli B, Darwish T. Determination of natural and artificial radioactivity in soil at North Lebanon province. J Environ Radioact 2013;125:36-9. Tzortzis M, Svoukis E, Tsetos H. A comprehensive study of natural gamma radioactivity levels and associated dose rates from surface soils in cyprus. Radiat Prot Dosimetry 2004;109:217-24. Abd El-mageed AI, El-Kamel AH, Abbady AA, Harb S, Youssef AM, Saleh II. Assessment of natural and anthropogenic radioactivity levels in rocks and soils in the environs of Juban town Yemen. Proceedings of Tenth Radiation Physics and Protection Conference, 27-30 November 2010, Nasr City - Cairo, Egypt; 2010. p. 321-7. Iqbal M, Tufail M, Mirza SM. Measurement of natural in marble found in Pakistan using a NaI (Tl) gamma-ray spectrometer. J Environ Radioact 2000;51:255-65. Environmental impact assessment report on the proposed Obajana earth dam project. Dangote Group, Marble House, Ikoyi Lagos; 2004. Najam LA, Al-Jomaily FM. Natural radioactivity levels of limestone rocks in northern Iraq using gamma spectroscopy and nuclear track detector. J Radioanal Nucl Chem 2001;289:709-15. Ademola AK, Hammed OS, Adejumobi CA. Radioactivity and dose assessment of marble samples from Igbeti Mines, Nigeria. Radiat Prot Dosimetry 2008;132:94-7. In: Herbert LV, de Planque G, editors. EML Procedure Manual, 26 th ed. New York: US Department of Energy, Environmental Measurement Laboratory; 1983. Krmar M, Varga E, Slivka J. Correlations of natural radionuclides in soil with those in sediment from Danube and nearby irrigation channels. J Environ Radioact 2013;117:31-5. Jibiri NN, Fasae KP. Activity concentrations of 226 Ra, 232 Th and 40 K in brands of fertilizer used in Nigeria. Radiat Prot Dosimetry 2012;148:132-7. Kitto ME, Fielman EM, Hartt GM, Gillen EA, Semkov TM, Parekh PP, et al. Long-term monitoring of radioactivity in surface air and deposition in New York State. Health Phys 2006;90:31-7. Jibiri NN, Emelue HU. Soil radionuclide concentration and radiological assessment in and around a refining and petrochemical company in Warri, Niger Delta, Nigeria. J Radiol Prot 2008;28:361-8. Omoniyi IM, Oludare SM, Oluwaseyi OM. Determination of radionuclides and elemental composition of clay soils by gamma- and X-ray spectrometry. Springerplus 2013;2:74. Montes MI, Mercader RC, Taylor MA, Runco J Desimoni J. Assessment of natural radioactivity levels and their relationship with soil characteristics in undisturbed soils of the northeast of Buenos Aires province. J Environ Radioact 2012;105:30-9. Kurnaz A, Kucukomeroglu B, Keser R, Okumusoglu NT, Korkmaz F, Karahan G, et al. Determination of radioactivity levels and hazards of soil and sediment samples in Firtina Valley (Rize, Turkey). Appl Radiat Isot 2007;65:1281-9. Berekta J, Matthew PJ. Natural radioactivity of Australian building materials, waste and by-products. Health Phys 1985;48:87-95. Gupta M, Mahur AK, Varshney R, Sonkawade RG, Verma KD. Measurement of natural radioactivity and radon exhalation rate in fly ash samples from a thermal power power plant and estimation of radiation doses. Radiat Meas 2013;50:160-5. United Nation Scientific Committee on Effects of Atomic Radiation (UNSCEAR) Sources and effects of ionizing radiation. Report to the General Assembly with Scientific Annexes, New York; 2000. Dragovic S, Jankovic Lj, Onjia A. Assessment of gamma dose rates from terrestrial exposure in Serbia and Montenegro. Radiat Prot Dosimetry 2006;121:297-302. European Commission. Radiological protection principles concerning the natural radioactivity of building materials. Radiation Protection 112, Directorate-General, Environment, Nuclear Safety and Civil Protection, European Commission, Luxembourg; 1999. Farai IP, Isinkaye MO. Radiological safety assessment of surface-water dam sediments used as building materials in southwestern Nigeria. J Radiol Prot 2009;29:85-93. Stojanovska Z, Nedelkovski D, Ristova M. Natural radioactivity and human exposure by raw materials and end product from cement industry used in building materials. Radiat Meas 2010;45:969-72. Baykara O, Karatepe S, Dogru M. Assessment of natural radioactivity and radiological hazards in construcution materials used in Elazig, Turkey. Radiat Meas 2011;46:153-8. Lu X, Zhang X. Radionuclide content and associated radiation hazards of building material and by-product in Baoji west China. Radiat Prot Dosimetry 2008;128:2471-6. Sharaf M, Mansy M, El Sayed A, Abbas E. Natural radiation and radon exhalation rates in material used in Egypt. Radiat Meas 1999;3:491-5. Righi S, Buzzi L. Natural radioactivity and radon exhalation in building materials used in Italian dwellings. J Environ Radioact 2006;88:158-70. Yasir MS, Ab Majeed A, Yahaya R. Study of natural radionuclides and its radiation hazard index in Malaysian building materials. J Radioanal Nucl Chem 2007;273:539-41. Khatibeh AJ, Ahmad N, Matiullah, Kenawy MA. Natural radioactivity of marble stones - Jordan. Radiat Meas 1997;28:345-8. Faheem M, Mujahid SA, Matiullah. Assessment of radiological hazards due to natural radioactivity in soil and building material samples collected from six districts of the Punjab province - Pakistan. Radiat Meas 2008;43:1443-7. Krstic D, Nikezic D, Stevanovic N, Vucic D. Radioactivity of some domestic and imported building materials from South Eastern Europe. Radiat Meas 2007;42:1731-6. Turhan S, Baykan UN, Sen K. Measurement of the natural radioactivity in building materials used in Ankara and assessment of external doses. J Radiol Prot 2008;28:83-91.